For one glorious year (involving a ton of travel to Africa) I was CTO and member of the founding team of Andela, the world's premier Global Talent Accelerator, backed by the founders of Facebook, AOL and Ebay, among others. We are growing quickly and in the process of training 100 thousand young Africans across the continent to be world-class software developers. The department I led was responsible for developer recruitment, technology and, educational/mentoring/professional development programs. I was the CTO (Chief Technical Officer) of a promising NYC-based startup called Lean Startup Machine (later rebranded as Javelin). We pioneered use of The Validation Board and I was responsible for delivering collaboration software based on our ideas. In early 2014, we debuted QuickMVP.com as the premier tool for building Lean Startup-flavored marketing experiments. Over the years I've invested quite a bit of time and money into producing legal documents suitable for selling software consulting services and web startups. 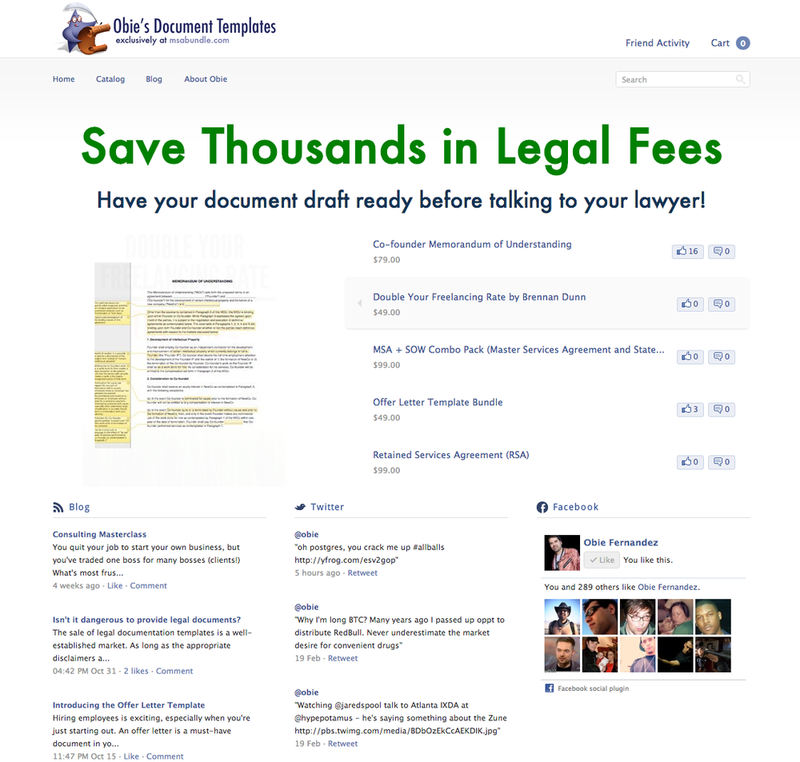 MSA Bundle is where I sell templates of those legal documents online. Each downloadable template package includes fully-annotated MS Word, Pages and PDF versions. I am the founder and CEO of a web-based software service called DueProps. We make the daily expression of gratitude and appreciation among co-workers fun and easy. I am the original Founder of Hashrocket, one of the world's top web design and development agencies. If you need high-quality, large-scale custom web application development, then you need Hashrocket. After growing the business to over 50 people and nearly $7M in revenue in 2010, I sold my stake to my partner Marian Phelan so that I could move back to Atlanta and pursue new opportunities in the startup world. During our prime, we were the ultimate destination employer for Ruby on Rails experts. From our architecturally-stunning offices on the beach in Jacksonville, Florida, to our cozy loft in the birthplace of Rails itself, Chicago, we attracted the best talent that the Ruby and web design world had to offer and really made a name for ourselves in the business. I will probably write a book about the personal side of my Hashrocket story someday. For now, suffice to say that it was one of the most exciting and rewarding experiences of my life. I forged memories and friendships there that will last a lifetime. I remain an informal advisor and huge advocate of Hashrocket to this day.